Like most institutions of higher ed, we have acquired quite a bit of artwork through donations. The value of the items is wide-ranging, from what we might call "important" to the purely sentimental. We have, for example, a handmade 36-star American flag (ca. 1865) made by a benefactor's grandmother in the 19th Century, a beautiful hand-carved tribal figurine in African blackwood, and a handful of 18th century portraits. 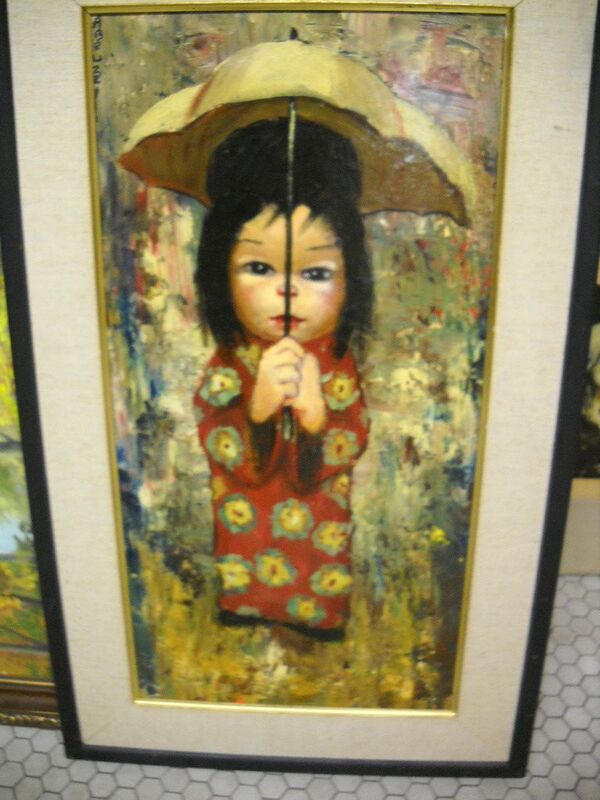 We also have a lot of reproductions and a number of framed popular prints of the kind sold by Costco and Ikea. Separating the wheat from the chaff is important if we're talking about insurance -- which has been an interesting discussion for the past year. We only want to insure what's worth insuring, but we lack any systematic record of what we own (no surprise there in the Lone Arranger world). Fortunately, we have smart student workers so we're in the process of creating a new record. This means a lot of digital surrogates. My summer student worker, Monica Alvarez, is taking pictures of all the "art" she can find: in frames and unframed, hanging, sitting, leaning up against a wall, piled on top of a cabinet, stacked in a closet. A similar project was begun in 2008 but all we have is photos (surrogates) and no information about them in terms of what, where and when they were taken. Back to the drawing board. This time, we're being systematic and applying Lone Arranger Best Practice, out-of-the-box (okay, off the website) Dublin Core Metadata Elements in a simple Excel file. We settled on the very basic but pretty functional naming convention approach; you can pack a lot of information in a 24-character string. So "CL4," for example, tells us 4th floor of the Chalon Library. That data goes into the spreadsheet along with descriptive information, and it corresponds to a specific CD-ROM with the JPEGs. It's not foolproof (what if someone moves the item to another floor?). But sometimes -- most of the time -- we Lone Arrangers have to make on-the-fly decisions that will fulfill a short-term need. Lacking a budget and a database, a spreadsheet and CD-ROM is about the only approach we can take. They're just surrogates, remember, and it's easy enough to re-take the pictures. Again. This isn't a "preservation" collection. What's fun is Monica's enthusiasm for and interest in metadata, a term she hadn't encountered as an art major. She's got fantastic organizational skills and the whole thing really appeals to her. It's exactly that kind of helper that puts the smile on the face of every Lone Arranger.